If your Dynamics CRM Online instance has been upgraded to Orion (CRM2013) you will need to upgrade to the latest version of the Ribbon Workbench for CRM2013. Since the Ribbon Xml Schema has changed slightly with CRM2013, the old version will no longer work. 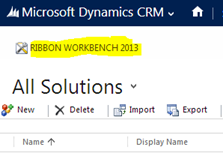 Download and Import the Ribbon Workbench for CRM2013. Ribbon 'XML' Workbench for Dynamics CRM 2013 with a silent 'XML'!